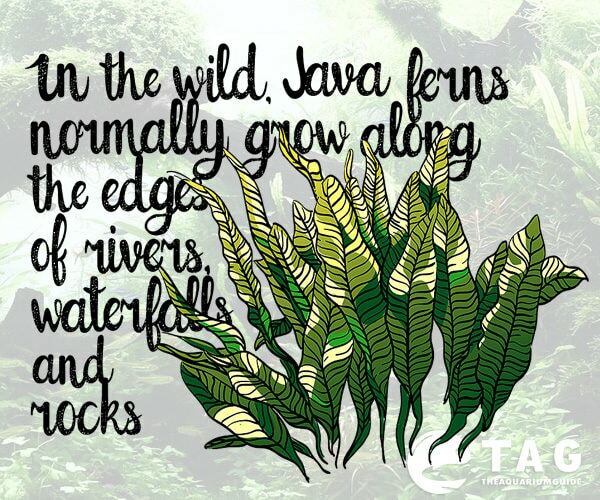 The Java Fern doesn’t require any special living conditions. It can be grown in tanks as small as 10 gallons with low light and water between 72-82 degrees Fahrenheit. Water pH should be between 6-8 and it can handle soft to moderately hard water. Usual fertilizers may be added for extra nutrients, but if the water is kept clean and in good condition, they are quite optional. Avoid plant nipping or shredding fish if you want it to display smooth and beautiful leaves. The Java Fern doesn’t like its roots buried in the substrate and is very likely to grow extremely slowly, if not even die off if buried. It uses its leaves to absorb nutrients, so roots should be attached to pieces of wood or rocks instead of buried in the substrate. You can do this by tying the roots with a piece of fishing wire, thread, rubber bands, or zip ties. Most aquarists prefer using thread, as it will dissolve over time and leave the roots fastened around the surface. Rubber bands and zip ties are easily noticeable, so you may want to remove them after the roots are secured. In a few weeks, the fern should be firmly attached to the surface and start growing. Due to its large size and wide leaves, this aquarium plant should be placed in the middle through background of the tank. Placing it in the foreground will hide everything else in the tank. 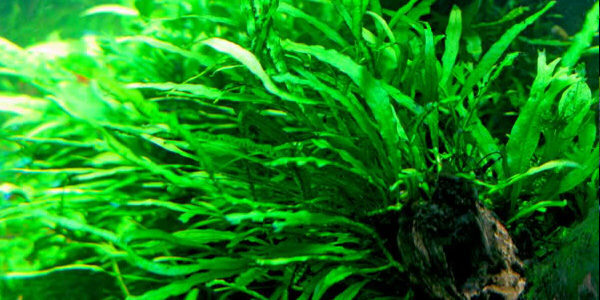 This aquarium plant is pretty easy to keep, so it is very popular with beginner aquarists. It doesn’t need any fancy substrate or extra carbon dioxide, as other plants require. In fact, the Java Fern does well without any fertilizers at all, so there’s no reason it should not survive in basically most of the tanks. Be careful not to bury the roots into the substrate, as this may kill the plant. Be careful with lighting, though, as strong light will “burn” the leaves, leaving transparent or brown spots, which will have to be removed. Instead, use subdued fluorescent bulbs or small incandescent ones, usually provided for small aquariums. The hardy Java Fern can even be kept in low to mid-brackish water, so if you need an easy to keep plant that can handle a little bit of salt, this is just the right one. It will thrive with water salinity up to 1.009. The Java Fern will easily grow adventitious plantlets in order to spread around the tank. They will form on old leaves and are easy to remove and replant. The young plants can be placed anywhere in the tank, provided there is enough space. Tie the roots to the surface you want them on and in a few weeks, they will grow attached to the wood or rock(s). When reaching maturity, new plantlets will develop and the process may start all over again. This aquarium plant will thrive with most tropical fish, as very few seem to bother with it. Even herbivore fish prefer to avoid it, possibly due to the bitter taste it has. Other researchers noticed the tough leaf structure is likely to make it unattractive for fish. Of course, goldfish will still try to feed on it, as with any other plant in the tank, but otherwise it will do quite well even with usually nipping fish. The Java Fern will provide safe hideouts for smaller or breeding fish, as well as for small fry trying to escape being eaten by adults. Be careful with large crayfish varieties, as they will try to destroy anything in the tank. Most pet or aquarium stores sell many Java Fern varieties that are cost effective. Some even sell them already attached to driftwood, sparing you the extra work. When indecisive about the plant to place in your tank, especially if you don’t have much time to care for it, go with the Java Fern.